The Princess Bride is one of our all-time favorite movies. So we had to laugh when the film inadvertently created a stir on a recent Qantas flight from Australia to New Zealand. Don't tell Rain Man, but Qantas may not be the safest airline to fly on anymore, now that they left people with threatening t-shirts on board. Apparently last weekend Wynand Mullins boarded a Qantas flight innocently enough. But the crew began getting complaints that the man's attire was freaking people out. A flight attendant approached Wynand and asked him to change his shirt to console the anxious fliers. When he replied that he didn't have an extra in his carry on, he wondered if they might give him a pilot's coat. But instead the subject was dropped. So what was he wearing that caused all the commotion? 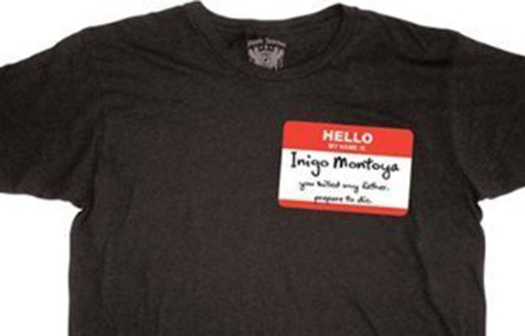 A t-shirt that read "Hello, my name is Inigo Montoya. You killed my father. Prepare to die." Apparently Wynand's fellow passengers had not seen "The Princess Bride" in which Mandy Patinkin's character has been on a lifelong quest for the revenge of his father's death. Instead they thought he was going to kill them all. Mullins told Stuff magazine, "I thought it was all a bit silly. The person next to me was laughing, because they knew the movie." What is the world coming to?